In 1954 the Topps card company, famous for sportscards, produced Scoops, a 156 card collectible trading card set consisting of famous events from the past. These cards also included sports figures, presidents and other historic achievements. These informative cards featured good stories and great graphics. They are a highly collectible and desired set that is very difficult to find in decent condition. 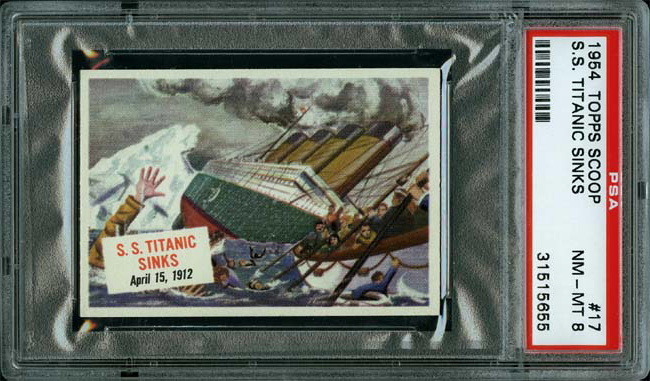 Card #17 shows the sinking of the Titanic with brief history on back in a newspaper type format. This card has been profesionally graded PSA 8 near mint -mint and is the highest graded example known to exist. Same card but graded one point lower at near mint 7 by Global Authentication (GAI). This scarce 1962 card is one in a series of 24 cards issued in Canada by the Nabisco Shredded Wheat Company of Canada with one inserted into each box. Each card depicts an image of an “Earth Shaking Events” or disaster from history. The back gives a brief description of the event featured on the front, written in both English and French. It is number 21 in the series, and features "The Sinking Of The Titanic" and measures approximately 2 11/16" x 1 7/16". This card is in mint condition. This1956 Operation Sea Dog card was issued in Canada by Parkhurst gum and measures 2 3/4" x 2 5/8". The story on the back is in both English and French.